This chemistry dictionary offers the chemistry definitions starting with the letter J. These glossary terms are commonly used in chemistry and chemical engineering. Click the letter below to find the terms and definitions beginning with that letter. j (total angular momentum quantum number) – The total angular momentum quantum number is a combination of the angular momentum quantum number, ℓ and the spin quantum number, ms. This quantum number is meant to represent the total angular momentum of a given particle and is expressed by a lower case j.
Jablonski Diagram – A Jablonski diagram is a diagram showing energy states of a molecule and transitions between these states. States are marked with horizontal lines and arranged vertically by energy. Transitions are indicated by arrows between states. Transitions, where radiation is released or absorbed, are marked by solid arrows. Radiationless transitions are denoted by wavy arrows. Jacobson’s organ – The vomeronasal organ; a chemosensory organ located in the nasal septum or roof of the mouth in vertebrates. Also known as: Vomeronasal organ, vomeronasal pits. jodium or jod – Jodium is the Latin name for the element iodine. joule – The joule is a derived SI unit of energy. A joule is equal to the kinetic energy of a kilogram mass moving at the speed of one meter per second. A joule is also the work done by a 1 Newton force moving a mass 1 meter or the energy dissipated when 1 ampere of current passes through a 1-ohm resistor. junction point – A junction point is a point where a polymer network forms branches. 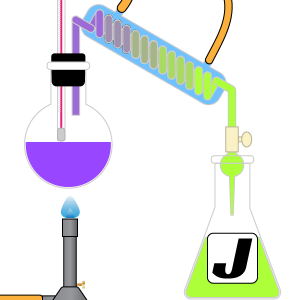 junction unit – A junction unit is a non-repeating atom or group of atoms that appear between monomer blocks in a block macromolecules.